Sites with direct access to the sea are popular, particularly those with a long season. 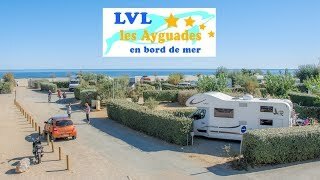 Camping LVL Les Ayguades is situated between Gruissan Plage and Narbonne Plage and is overlooked by the Montagne de la Clape. The site is owned by the LVL group who have recently updated the facilities and are committed to running the site with an eco-friendly mindset. There are sandy pitches of various sizes, all with 10A electricity. The pitches are hedged and there is some shade. The site also has chalets and mobile homes to rent, plus a number of privately owned accommodation. An upstairs restaurant has panoramic views of the sea. A wire fence with a gate separates the site from the wide sandy beach. 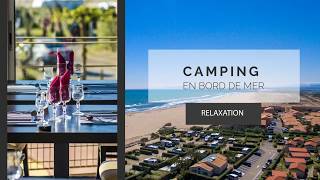 Nearby Gruissan with its port is quite an upmarket resort and has an intriguing area of houses built on stilts, which have featured in certain films. Le Clape is popular for mountain biking, horse riding and walking or climbing. The town is planning a new swimming pool complex nearby. Two fully equipped toilet blocks have been renovated and include facilities for disabled visitors. Launderette. Motorhome services. Shop, bar and takeaway (286-31/8). Restaurant (15/4-10/11). Play area and skate park. Fitness room. Children’s club. Evening entertainment in high season. Direct access to the Beach. 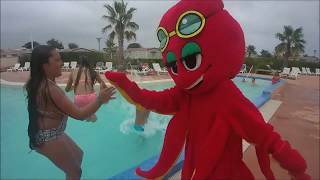 Heated swimming pool with Jaccuzi . Free WiFi. 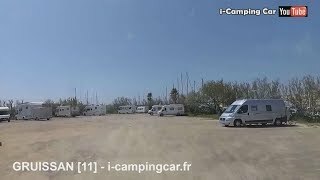 From the A9 at exit 37 (Narbonne Est), follow the D32 then the D332 towards Gruissan, then Les Ayguades until you come to site signs.